Published: July 10, 2014 at 12:06 p.m. 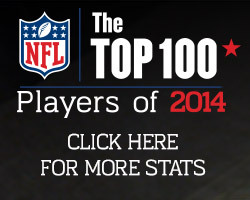 Updated: July 10, 2014 at 07:15 p.m.
Click HERE for an in-depth look at the top trends from all four years of the Top 100 Players series. 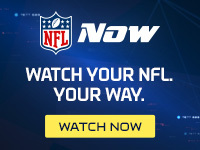 NFL Network's The Top 100 Players Of 2014 countdown reached its conclusion Wednesday with Peyton Manning sitting in the big chair. We imagine Manning partied well into the night upon learning the good news. 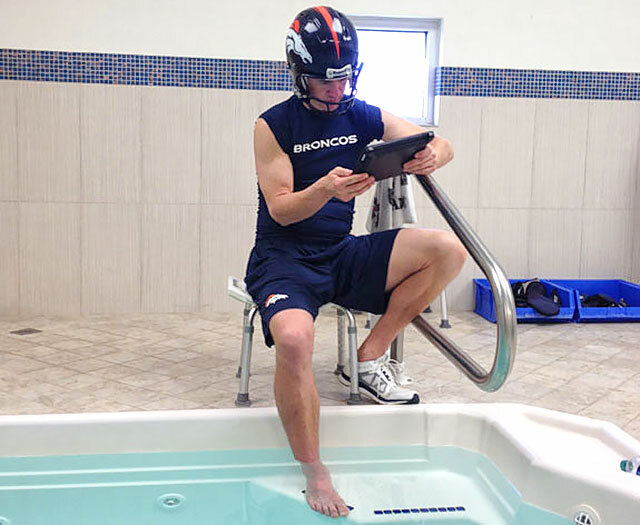 Either that, or he dangled his leg in a hot tub while reading a playbook with his helmet on. One or the other. This is the first time Manning has finished No. 1 since NFL Network began the much-scrutinized Top 100 series in 2011. The Denver Broncos quarterback finished second behind Adrian Peterson in 2013, 50th in 2012 (the year he was coming off neck surgery) and second again in 2011. Manning is in select company when we look at the Top 100 series as a whole. Manning is one of just 24 players who have cracked the Top 100 in all four years. Tom Brady has consistently placed the highest, with 3-4-4-1 rankings. Brady and Adrian Peterson are the only players who have placed in the top 10 every year. That's some Canton style right there. The biggest drop a player who remained on the list has ever suffered? Steelers safety Troy Polamalu, who sunk from No. 6 in 2011 to No. 91 in 2013. Polamalu got healthy this past season, leading to a 30-spot jump to 61 in 2014. Speaking of jumps, nothing sticks in the minds of voters like a Super Bowl-winning quarterback. Russell Wilson (20), Joe Flacco (19), Eli Manning (31) and Aaron Rodgers (11) all received a popularity pop after lifting the Lombardi. That's not a typo, by the way: NFL players declared Joe Flacco the 19th-best football player in the world last year. Hit it, Liz Lemon. Yes, life is good for NFL quarterbacks. A breakdown by position reveals that 12 signal-callers have landed in the top 10 in four years. After that comes seven running backs, who appear to get more respect from their contemporaries than NFL front offices. Six linebackers and six wide receivers have cracked the top 10, as well as five defensive backs, three defensive linemen and one tight end. That would be Jimmy Graham, who snuck in at No. 10 this year. Pay the man. Finally, let's tip some energy drink into the FieldTurf for four top 20 players from a year ago who didn't even crack the Top 100 in 2014. Ray Rice (13), Robert Griffin III (15), Matt Ryan (17) and my red-carpet buddy Ed Reed (18) all disappeared. Matt Ryan must be wondering what he did to earn that company. We wish we had an answer, Ice. Better luck next year. In the latest "Around The League Podcast" the guys reveal their personal top 10 lists to coincide with the "Top 100" finale.